Habit at Hanamu Rd Makawao, Maui, Hawaii (USA). June 03, 2009. Origin and Habitat: Pritchardia hillebrandii is endemic of Molokaʻi, Hawaii islands, USA. 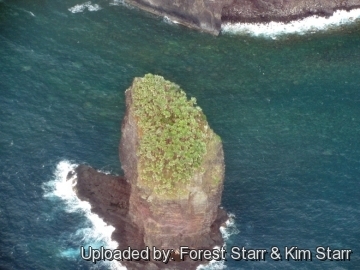 Habitat: It grows in dry forest near sea level, only about 300 Pritchardia hillebrandii are said to survive a top to Huelo an Islet rising from the ocean just off the windward coast of Molokaʻi, and a few other trees exist on nearby Mōkapu Islet this is let due to the absence of rats and goats. 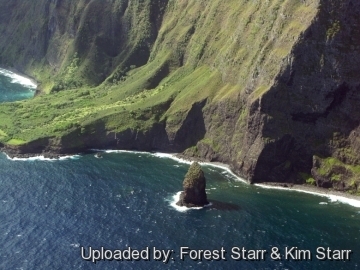 Up to 1970's a few palm were reported in the valleys at the base of the sea cliffs of north coast of Molokaʻi, but today they are extinct. 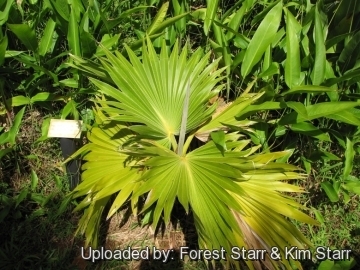 Description: Pritchardia hillebrandii is a small to medium sized palm with large fan-shaped leaves. Stem: Solitary, upright, about 5-7(-8) m tall and 25 cm in diameter, smooth or fibrous when young, with vertical fissures on a dark grey background, and obscurely ringed by leaf scars. .
Leaves: 120-200 cm across, costapalmate, induplicate, undulate, forming half to two-thirds of a circle, only slightly divided; Segments (leaflets), single-fold, rigid, leathery, bifid with stiff points, that don't droop much, if at all, light emerald green, silverish or bluish-green and smooth above; waxy greyish green cast (glaucous) below and devoid of scales; Petiole and lower ribs unarmed, densely covered in ash-grey felt. The leaf sheath breaks down into a mass of tawny fibres. Flower: Inconspicuous, not showy, pale white to yellowish flowers. The inflorescence is shorter or equal to the petioles with panicles branched to three orders. The flowers are perfect, containing both male and female parts. Fruit: Small globose, and characteristically ridged, measuring around 22 x 19 mm on fruit stalks as long as the leaf stalks (petioles) of about 90-100 cm in length. Seeds: 11-13 mm in diameter. Remarks: Pritchardia hillebrandii is related to Pritchardia glabrata, Pritchardia kaalae, Pritchardia maideniana, and Pritchardia remota. It is also similar to Pritchardia affinis but the heavy waxy coating on leaves and the black, ridged fruit are distinctive. 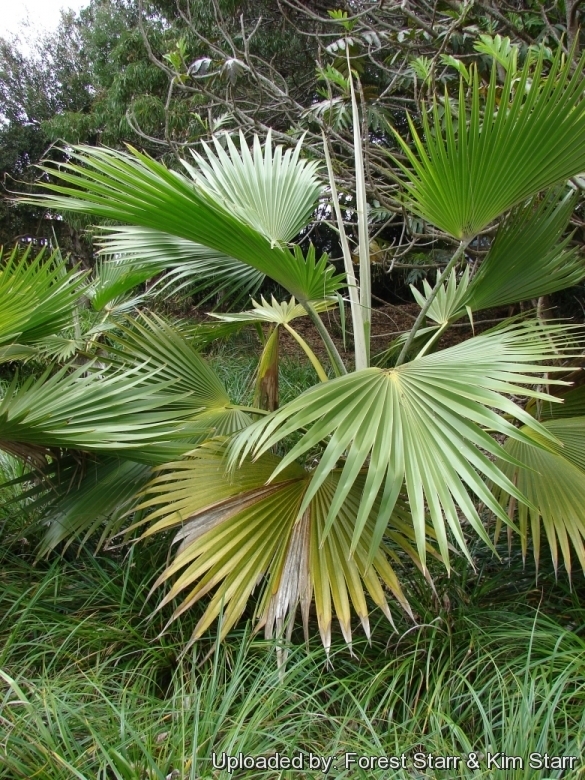 There is one a smaller form of this palm with blue colouration called Dwarf Blue in this variety, the waxy glaucous coating extends to the leaf upper surface. 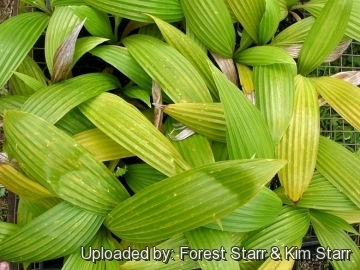 1) Forest & Kim Starr Pritchardia hillebrandii (Loulu lelo). Plants of Hawaii. <http://www.starrenvironmental.com>. Downloaded on 21 August 2014. 2) Wikipedia contributors. "Pritchardia hillebrandii." Wikipedia, The Free Encyclopedia. Wikipedia, The Free Encyclopedia, 17 Mar. 2013. Web. 3 Sep. 2014. 7) Gemmill, C. 1998. Pritchardia hillebrandii. The IUCN Red List of Threatened Species. Version 2014.2. <www.iucnredlist.org>. Downloaded on 03 September 2014. 8) Robert Lee Riffle & Paul Crafts "An Encyclopedia of Cultivated Palms", page 420. 10) Donald R. Hodel "A Review of the Genus Pritchardia", pages S-3, S-8, S-19- 11) Audrey Sutherland "Paddling My Own Canoe", page 131. Cultivation and Propagation: Many Pritchardias are fussy and difficult to grow outside the tropics, frequently suffering from a yellowing of the leaves, but Pritchardia hillebrandii is a pretty robust grower, very modest in its requirement, that likes sand, cinder or coral soil, but is adaptable to clay and loam both slightly alkaline and acidic. Good drainage is also important. It vary in shape. Specimens raised in dry and/or infertile soils tend to be smaller in stature with smaller leaves. Light also affects the plant's form while those grown in full sun are more compact. Hardiness: It is adapted to tropical and subtropical climates but tolerate a wide range of climates and will even tolerate cool conditions and a little frost ; they should be grown in cold green houses or at least in a place where they are sheltered by the wind; However mature specimens can endure temperatures down to about -4°C (for short periods), while young plants are more cold sensitive. Best kept above 5° C.
Wind and salt tolerance: Due to the natural coastal habitat, it does very well in low elevation landscapes and tolerates some salt spray. 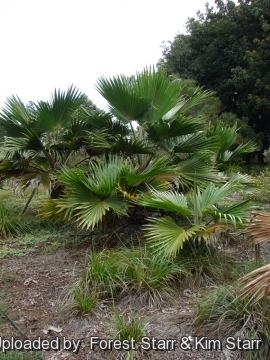 With a particularly windy climate it is suggested to secure young palm to long solid stakes, to avoid that the wind could bare young and not very developed roots; specimens which are only a few years old might fear intense wind. 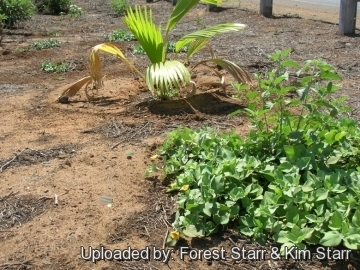 Propagation: Mature seeds buried half way in pot of clean, well drained potting soil, water daily, germinates within 4 weeks and grows quickly, plants of 30 cm can be put in ground/larger pot; Because these palms easily hybridize with other Pritchardias, claiming a specific species requires seed collection from wild populations.